A fine 18th century wall map of North America. 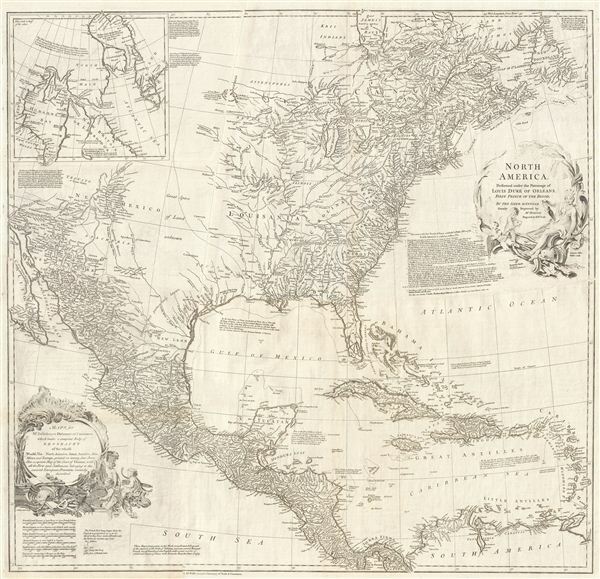 This is an exceptionally interesting and beautiful 1752 wall map of North America composed by Malachy Postlethwayte. Postlethwayte, an englishman, prepared this map for issue in conjunction with the second edition (1752) of his popular Dictionary of Trade & Commerce. Cartographically this map is based upon the earlier work of the French mapmaker J. B. B. D'Anville. This is a curious choice on Postlethwayte's part for he, a proud englishman, uses every opportunity to rail against the land grubbing improprieties of the French cartographers, especially D'Anville, who he feels has unfairly usurped British claims in the New World. To his credit, King George's War and just ended in 1748 and the French and Indian War, which would start in 1754, was already brewing. Many of the issues that influenced these wars, including overlapping colonial claims, are evident on this map. Postlethwayt hired the rather obscure english cartographer Mr. Bolton to update and rectify D'Anville's mapping. While evident throughout the map, some of the more noteworthy of these changes include the refutations of French claims east of the Mississippi, a rejection of French claims in Canada east of James Bay, and a reassertion of British claims in New Albion (north of New Mexico). True to form, Postlethwayte's interest is commerce, and, with specific reference to this map, cartographically wresting the lucrative fur trade in the upper Mississippi Valley and around the Hudson Bay away from the French. In addition to Postlethwayte's interesting, sometimes ranting, and patriotic commentary, this map features a number of additional interesting elements inherited from D'Anville. In drawing the map D'Anville made heavy use of reports of Native American cartographic knowledge brought back by French fur traders in the upper Mississippi Valley. There are numerous instances, such as the river connection between the Lake of the Woods and Lake Winnipeg (which through not shown is alluded to textually as 'Assenipoel Great Lake'), where D'Anville's cartography specifically sites indigenous groups, in this case the Assenipoel and the Oshagac. Similarly D'Anville notes American Indian groups and villages throughout the lower Mississippi Valley. Postlethwayte too makes copious mention of the American Indian Nations, even annotating D'Anville's work with the intention of highlighting British political alliances and trade agreements with the indigenous peoples, specifically the Iroquois and Chickasaws, over whom the British claimed informal sovereignty. Other areas of the map are drawn directly from D'Anville's work though much of the text has been translated to english. The Great Plains are identified as 'Great Space of Land Unknown' and Texas (Tecas) is here identified as 'Country Not Particularly Known.' The many missions appearing on both shores of the Upper Rio Grande near Santa Fe, in modern day New Mexico, are particularly well mapped. The Teguayo Nation appears in the unmapped region to the west of Santa Fe. Teguayo was identified as one of the Kingdoms of Gold presumed to be found in the unexplored American west. The name Teguayo first appears in the Benevides Memorial, where it is described as a kingdom of great wealth to rival Quivara, another mythical kingdom which curiously does not appear on this map. The idea was later popularized in europe by the nefarious Spaniard and deposed governor of New Mexico, the Count of Penalosa, who imagining himself a later day Pizzaro, promoted the Teguayo legend to the royalty of europe. Originally Teguayo was said to lie west of the Mississippi and north of the Gulf of Mexico, but for some reason, D'Anville situates it further to the west. A large inset map in the upper left quadrant focus on Hudson Bay and Baffin Bay. This area was of considerable interest to the French and British who believed that somewhere in the region a naval passage existed that would eventually lead to the Pacific – the legendary Northwest Passage. Unlike the Spaniards in Mexico, the neither the French nor the British had a practical route to the Pacific and the rich Asia trade from their colonies in North America. Moreover, without a outlet to the Pacific, the British, as Postlethwayt eloquently complains, had no way to enforce their claims in New Albion and the Pacific Northwest. Though today, due to polar melting, a Northwest Passage does exist, the efforts of early navigators to search for it invariably ended in tragedy. Postlethwayte's inscription appears in a decorative cartouche in the lower left quadrant. Another cartouche, in the upper right quadrant credits D'Anville, who originally drew this map under the patronage of the Duke of Orleans, who Postlethwayte claims, paid more than 1000 pounds for the work. The upper right cartouche also references one Mr. Bolton, an english cartographer who Postlethwayt employed to update and revise D'Anville's map. Bolton's name appears on a number of Postlethwayte's maps, but he remains an elusive figure. Later in the 18th century an S. Boulton produced a small number of maps, including an important map of Africa. Though there is no clear connection between the two Boltons, we may speculate that they were one and the same. engraved by R. W. Seale, this map was issued in the second edition of Postlethwayt's Dictionary of Trade and Commerce, 1752. The first edition, published in 1751, did not contain any maps. Postlethwayte, M., The Universal Dictionary of Trade and Commerce, Translated from the French of ... Monsieur Savary ... with large additions and improvements, incorporated throughout the whole work; which more particularly accomodate the same to the trade and navigation of these kingdoms, and the laws, customs, and usages, to which all traders are subject. (London) 1752. Very good. Four panels joined. New York Public Library, Map Division, Map Div. 00-348.